Open air stockpiles are a common sight around the globe, from ports to mountains to deserts, writes Melanie Saxton of Geometrica. Stockyard operators face rain, fluctuating temperatures and wind, which can deplete dry bulk inventories and affect the chemical composition of raw materials. But more importantly, manufacturers across various sectors are focused on the environmental impact of uncovered piles. Dust emissions and contaminated runoff can affect surrounding communities, vegetation and wildlife. With new environmental regulations across the world, covering existing stockpiles is or will be a requirement. Eco-friendly initiatives include the design and installation of long- span storage solutions that help stockpile operators tread more softly around Mother Nature. The goal is to seamlessly connect bulk storage and materials handling solutions with mining, cement, fertilizer and power generation operations. Of course, manufacturers want to cover their stockpiles; if only covering existing stockpiles were easy. Most of them were not designed to be covered and the mere thought of doing it sounds impossible without downtime and extremely high costs. As a stop-gap measure, stockyard operators have tried storing raw materials in silos, which are small, expensive and often impractical. A long-term solution was needed, and Geometrica answered the call with an all-terrain application designed specifically for industries that handle large volume bulk materials. Roel Castano, Vice President of Geometrica, addressed storage and environmental concerns as a speaker at the Cemtech Conference in Bangkok in June 2015. He noted the obstacles faced by global stockpile operators and offered an alternative to the limitations of traditional structures. Geometrica’s revolutionary patented all-terrain building system offers economical and efficient bulk storage options while lowering lifetime maintenance costs through excellent long span design, cladding options and safety accessories. Castano noted that Freedome® technology has taken long span storage to, literally, new breadths and heights. Freedomes — Geometrica’s trademark for free-style domes — provide all the advantages of circular domes with a non-circular plan. All tube members are different and may have lamella, kiewitt or lace insurface patterns and single or double structural layers. Big foundations for these large span roofs are not required, even at spans up to 300m. This allows versatility and flexible design options for irregular piles and stockyards. The Geometrica system includes a node, or linear thread aluminium connector, that joins galvanized steel or aluminium tubes. The ductile behaviour develops 130% of the steel tube’s rated yield strength and transfers bending. It features human- scale modules, dense packing volume, and easy installation requiring minimal use of rigging equipment with no field welding required. Only Geometrica’s non- traditional structures provide the strength and span necessary to enclose stockyards of any size in any location. The column-free space is unique in that it allows the transfer of moments across the joint. Notably, the barrier-free interior allows the maximum use of space, while allowing the free-flow of traffic, personnel, vehicles, conveyers and other equipment — even while the pile is in operation.This equates to zero downtime or loss of productivity. 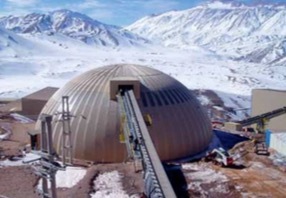 Hundreds of uncovered stockpiles still exist worldwide and can benefit from Freedome® technology. Now mines, plants and factories can opt for a new vanguard in long span design in any terrain or climate. Geometrica’s environmentally sustainable enclosed domes protect stockyards of minerals, limestone, clay, clinker, coal, marl, wood chips, fertilizers and sulphur from outside elements, and ensure the landscape is protected from particulates and groundwater leeching — a win/win situation for manufacturers and the communities they serve. Geometrica is an award winning international firm serving industrial and environmental protection markets worldwide. The company believes a culture of safety begins within an organization and extends to its products and services, and explicitly values ethics, safety, quality, learning and continuous improvement. Worker safety is a priority — a value advanced by certifications in health, safety, environment, management and manufacturing processes. Geometrica implemented a quality management system (QMS) through an internal company wiki, which helped achieve safety certification status in a minimal time. EN 1090 construction products standard certification — New CE marking for design and manufacturing of components and structures made of steel and aluminium for the execution of structures. As a second-generation dome builder founded on gridshell technology that has been in development for 50 years, the company leads the market in freestyle, long span and light weight domes and space frames with projects in more than 30 countries. Loose bulk materials are most economically stored outdoors, but some conditions can necessitate storage under cover, writes Frank Warmoth, PE, Manager Business Development Bulk Handling and Terminals at Bruks Rockwood Inc. When the materials are sensitive to contamination or natural elements, or where they pose a threat to the surrounding environment, it becomes necessary to store them in an enclosure. The equipment to store and reclaim a given material and the structure in which it is stored are interdependent and technical solutions have evolved along economic lines, coupling together types of enclosures with the equipment inside. The first delineation is between manual handling and automatic storage and retrieval. Since manual methods like mobile equipment are inherently lower capacity and dry bulk cargo terminals typically require rapid unloading and loading of materials, only automatic high capacity solutions will be discussed here with emphasis on enclosed systems. Its properties determine the best equipment to convey a bulk product, place it in storage, and reclaim it for processing or shipment. These decisions and the required storage capacity narrow the choices of storage structure. Process and shipment requirements determine the storage capacity. Requirements for FIFO (first in/first out), separation or blending, and the physical space available further clarify the options. Generally, FIFO enclosures must be discharged from the bottom of the pile (e.g. gravity flow, plow, vibrating pile discharger, screw reclaimer, etc). Separation into piles requires a large foot print, often a rectangular enclosure with discrete stacking and reclaiming or separate enclosures like silos and domes. It requires stacking and reclaiming equipment that can access each pile like a tripper, shuttle conveyor, or travelling stacker, and a scraper type reclaimer that reclaim from the top of the pile. Blending is best accomplished by a rake- type bridge reclaimer that reclaims across the full pile cross section. Some classes of materials have fairly well-established handling and storage methods. An example is the use of silos to store free-flowing materials like grain and cement that are also sensitive to contamination and moisture. Silos should be avoided for materials that are compressible, cohesive, or don’t flow freely. The exception to this is when aggressive reclaiming equipment usually acting on the top of the pile is employed. Mechanical or pneumatic conveyors are used to fill the silos and gravity, often aided by vibratory dischargers is most effectively used to discharge onto conveyors. Silos occupy the smallest footprint per ton of storage. Where high storage capacity is required, the most economical means of storage is a linear system in a structure with a rectangular footprint. Enclosures of this style require a large footprint per tonne relative to others. This is the easiest system to expand by simply increasing length of rails, conveyors, and structure. Different types of rectangular structures are utilized with size and local capabilities often determining the most economical solution. Most storage halls are open between the outer walls to allow the equipment free access to the material. This requires long-span structural concepts that can be accomplished with arches, tapered girders, trusses, geodesic panels, or hybrid structures. Pre- engineered metal buildings have been used extensively but tension fabric buildings are gaining popularity due to competitive cost. The characteristics of the stored material must be considered including dust emission and corrosiveness for loadings and protection of the structure. Some moisture-sensitive products must be stored in a controlled climate which increases enclosure cost considerably. In addition to HVAC equipment, the enclosure must often be insulated. Linear systems usually require separate machines for stacking and reclaiming so each can act independently at the same time. Stacking is accomplished by rail mounted machines at grade or in the roof of the structure. Travelling trippers and shuttle conveyors are the typical roof-supported stacking methods. Luffing stackers on rails at grade are an option when dusting is a problem. A-frame to support the boom allows a longer reach across the pile, and by using a shorter auxiliary boom the height of the machine is reduced for indoor use. Bridge reclaimers, also described as rake-type or blending bed machines, agitate material across the end surface of a pile as the machine advances, causing it to cascade to a chain conveyor that drags it to the discharge conveyor. This action is an effective means of blending the material contained across the pile cross-section. A scraper reclaimer can start at any point on the pile while the bridge reclaimer must always operate from an end, which is mainly a pile management issue. Circular stacking and reclaiming systems provide a means of medium capacity storage with automatic operation. These systems allow storage of a broader variety of materials than silos because a wider variety of reclaiming methods can be employed and arching of material can be avoided. Circular systems are typically enclosed in either thin shell concrete domes, or metal structures. Material can be distributed in the structure by conveying to a centre feed point on top, or to an automatic stacking device, most commonly a circular belt stacker. Stackers distribute material in a 270–360° arc, depending on the reclaim method. Reclaiming equipment options are effectively the same as for linear systems, with the same pros and cons. Again, above-ground scraper or blending bed reclaimers are among the most cost-effective systems. This system usually takes the form of a single machine commonly called a circular stacker/reclaimer. Concrete domes are most cost effective when the lower walls are used to retain material, decreasing the enclosure cost per tonne of stored material. Since material is stacked against the lower wall, the volume of material per foot of diameter is higher. Stacking against the walls eliminates the possibility of an outer rail to support a bridge and therefore requires a counterweighted reclaimer. When blending is required a blending bed is preferred and an outer rail is required. The choice of enclosure then becomes a price contest between a larger diameter concrete and aluminium geodesic dome. The aluminium structure is now a viable option since there are no material forces against the lower walls. Steel structures are normally more limited in diameter because the economics of design favours aluminium geodesic at larger diameters. Installation cost of aluminium geodesic structures is also low in comparison. BRUKS® Rockwood Inc. of Atlanta supplies automatic conveying, storage, and loading equipment to industries and dry bulk cargo terminals, including linear and circular systems designed for enclosed or outdoor storage. BRUKS®’s portfolio includes pole stackers, fixed stackers, radial stackers, circular stackers, portable rubber tire stackers, and rail mounted linear stackers; all either fixed height or luffing. Linear and circular stackers typically have counterweighted booms that luff for dust control, pile management, and to clear the reclaimer. BRUKS®’s portfolio also includes designs for portal and counterweighted linear and circular scraper type and blending bed type reclaimers. structures, golf bridges, foundations, towers, solar; and v frames radar platforms etc. fast delivery and construction in any location. Throughout its 51 years,Triodetic has been recognized internationally for its expertise in design and construction of space-frames, domes, shell and free-form structures with all products compliant with sustainable building requirements. It is credited with numerous industry awards and many landmark projects throughout North America, Caribbean, South America, Europe, Africa, Australia & the Pacific, China and the Middle East. Since the 1960s,Triodetic has been an internationally recognized supplier of space frames, geodesic domes, shells, and free-form structures. Triodetic holds numerous patents and trademarks for its technology and all products are supplied in compliance with sustainable building initiatives. All Triodetic activities are performed in compliance with OSHA (Occupational Safety and Health Administration) requirements and ISO quality management principles. Triodetic maintains exacting engineering standards and talented management to consistently ensure the design, construction and service requirements of each structure. ESI Eurosilo is a leading Dutch engineering and contracting company in storage solutions for non-free flowing bulk solids and large quantities. What started with an innovative storage silo for a Dutch potato starch manufacturer in the late 1960s, has now evolved into a range of powerful Eurosilo Solutions for customers in major industries around the globe. The company’s expertise has been recognized by operators, engineering contractors, consultancy agencies and material handling engineers throughout the power industry, chemistry and agriculture. Eurosilo is eager to work in close co-operation with customers and technology partners, so that it can develop an ideal solution for each situation. The company is ISO 9001 and OHSAS 18001 certified and its storage solutions are compliant with ATEX and NFPA standards. In February this year, ESI Eurosilo was awarded a contract by KMC to design, produce and install the internal machinery for the world’s largest potato starch silo that is now being constructed at Karup in Denmark. This silo will have a maximum capacity of 88,500m3 of starch. KMC is a Danish producer of potato starch and potato flakes. The project’s execution is on a very tight schedule, as the silo has to be ready for operation before the end of this year. ESI Eurosilo’s silos are ideal for non-free flowing bulk solids and large quantities. Its highly automated silos offer maximum control in material handling, up to 100,000m3, while saving operational costs and valuable space. Totally enclosed storage systems are made possible by the application of the Dutch Eurosilo® concept, which meets the requirements of Environmental Protection Agencies worldwide. Using covered storage for bulk commodities prevents contamination of surrounding land by dust from outside stockpiles, or polluted drain water; it also prevents deterioration of material caused by weather conditions such as frost, wind and rain. This is important to maintain quality standards; it also means that there is no need to remove excess moisture at a later stage. Triodetic provides dome structures to store limestone and other cement elements like aggregate; sand, gravel, crushed stone, and slag. In order for the elements to maintain dependable properties, they must be kept in a structure that will contain their chemical composition. Triodetic domes are efficient shapes that provide enough space for the concrete elements to have air ventilation, and keep moisture build up from happening. Not only is Triodetic a company that produces architectural storage, but it is also one of the most effective companies to provide structural engineering. Its unique Tube and Hub connection removes welding or bolting from the framing and allows for single layer, double curvature structures as well as Space Frame construction with faster assembly times and reduced maintenance. Unlike some of its competitors, it provides reduced structure mass and reduced foundation, environmental benefits, environmental protection, as well as functional and affordable benefits. reduced structure mass and reduced foundation: the adoption of curvature in structures is a growing trend in building design, not only for visual appeal, but because the design advantaged often effectively reduces structure mass, material and construction costs. Lightweight frames and structural shells can be more economical than traditional beam-column arrangements. A dome roof for instance may require only a third of the steel mass of conventional members. Curvature in structural members and cladding materials has become very economical. Lower mass structures require smaller foundations. The tangible outcome is lower costs and faster construction. environmental protection: the control of emissions (e.g. dust, odours, seepage) is becoming mandatory in many countries as more stringent environmental legislation is imposed on many industries. Triodetic provides enclosures to minimize dust, odour and other emissions from granular stockpiles, (e.g. conical, longitudinal, and concentric) and processing facilities (e.g. thickeners, water and waste water tanks and basins). functional and affordable: Triodetic assists in evaluation structural arrangements for enclosures, buildings and roofs to best address all physical, financial and time constraints. The company aims to provide cost-effective and state-of-the-art solutions that not only perform as desired for the service life specified, but also are safe to construct and are completed on time and within budget. Triodetic has extensive structural design and construction experience which is available to customers at all stages of project evaluation and final operation. durable materials and protective finishes: Triodetic frames are manufactured in materials appropriate for the desired service life in most industrial environments. Framing can be fabricated from galvanized steel and aluminium and other non- metallic materials, plus a range of protective coating solutions are available. Triodetic recognizes the value and importance of sustainable building design. Its commitment to the company where it operates and those where its structures are built and used is demonstrated in its design, fabrication processes, products supplied and installation techniques employed.